The only reason I was aware of Roberts history was that I included a chapter on her and her house in my 2011 book on the Robert's cousin house in Buffalo (Walter V. Davidson). I did a brief family tree on Roberts to provide some of that information. 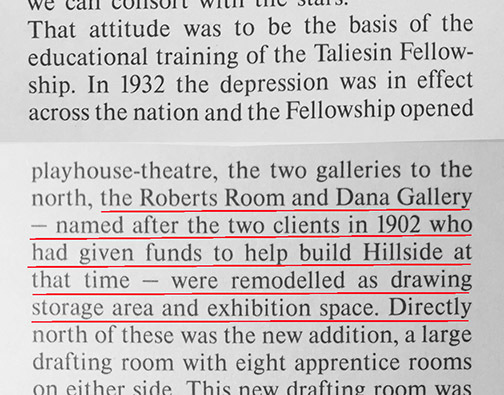 The AT TALIESIN article announced the naming of the Dana and Roberts Rooms in their article dated July 12, 1934. According to Wikipedia, Roberts had died just a few months earlier in March 1934. 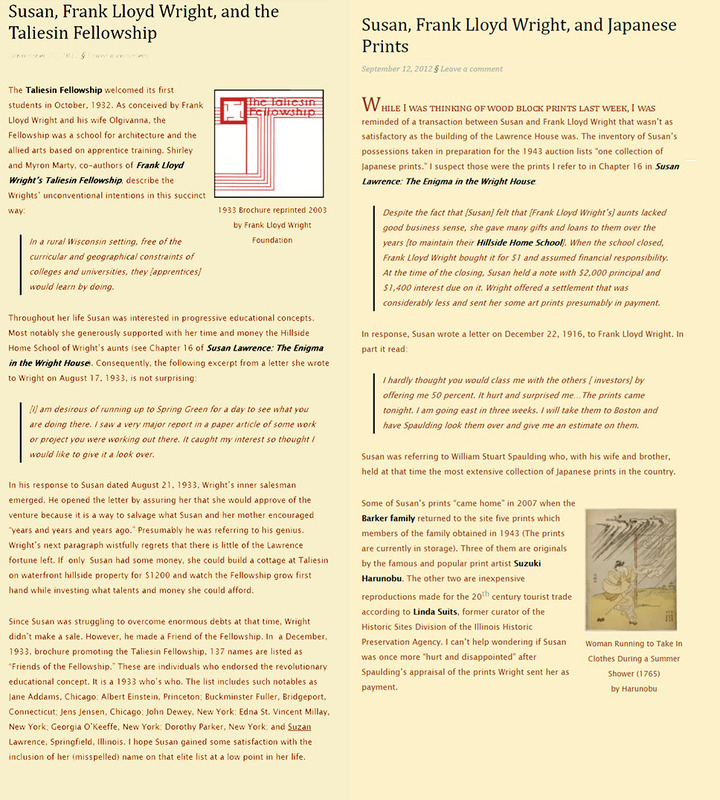 Perhaps Wright was touched by his passing, and that immediate timing factored into the naming (?). Also, they report that Roberts was related to Harlan Bradley from Kankakee. Yes. The two classrooms were completed in 1903 as part of the Hillside Home School construction for aunts Jennie & Nell. 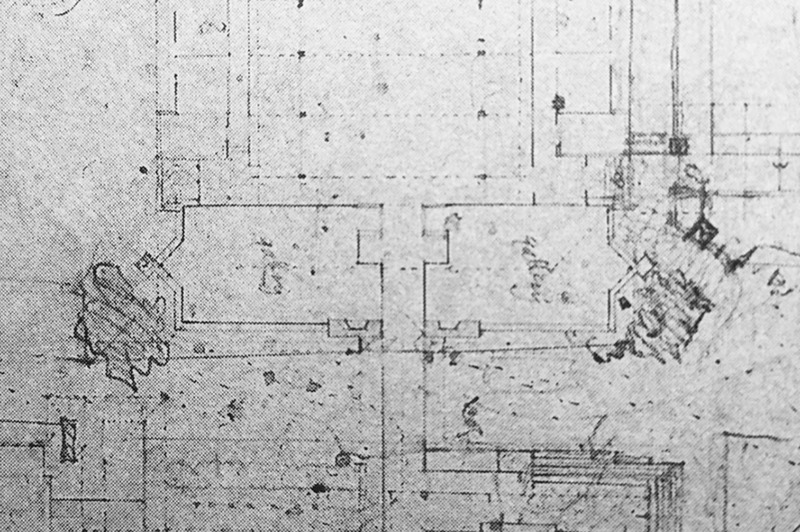 The Drafting Studio was begun in 1932 & the Fellowship put a lot of work into it right in the beginning, but couldn't quite get it done. They kept working on it over the years, always with the feeling that they were finishing shortly, but didn't get the finish floor until Nov. 1938. They moved in the next summer after they got back from Arizona. 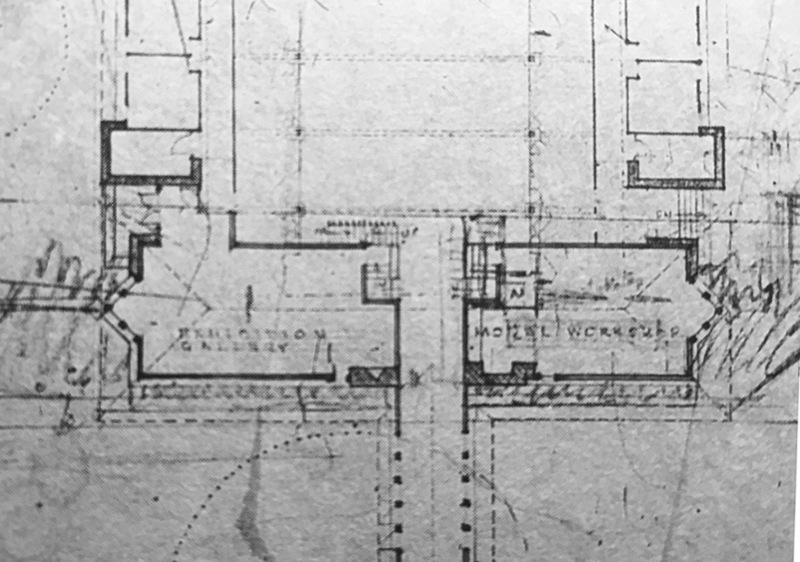 You can see the room with the unfinished flooring in the January 1938 Architectural Forum magazine issue devoted to Wright. Thanks SpringGreen for clarifying the timeline. That's the project number for the drawings of the space underneath the Roberts Rm. that FLW was thinking about for an archive in the floor below. It would have been interesting if work had been done on that. 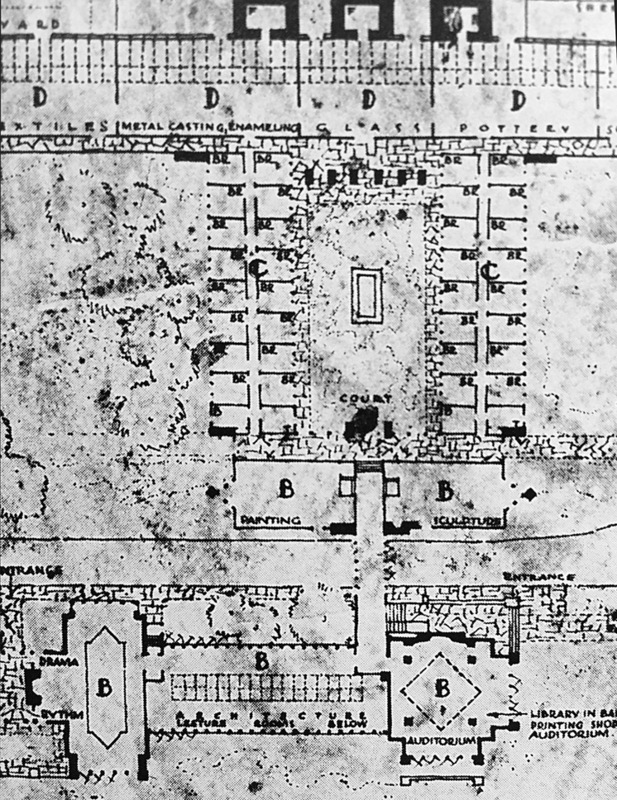 At least one of those drawings is reproduced in the Completed Buildings, v. 3. The Fellowship made the decision to get those things to the desert, which makes sense in keeping them out of the humid Midwest. I can't imagine how angry FLW would have been to see those things then end up in NYC. 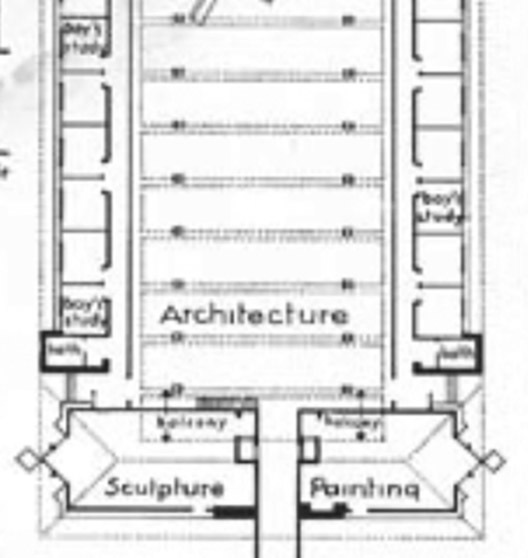 I also can't imagine how FLW thought it would have been possible to put his entire archive under the Roberts Rm., which is smaller than the Dana Gallery. Cool what one learns here.